(Instructions: Below are different galleries of photos of our personal crystal skulls. above the photos or if you click on any photo, will appear larger on your screen. I have always had a really strong connection to stones and crystals. I have never been particularly drawn to crystal skulls until after listening to your blog talk show today and checking out your website. I was immediately drawn to Portal and geronimo, but when I saw Blue Starfire, it was LOVE at first sight!!!!! I got “shivers” when I saw it and I know I energetically connected with it. (I got shivers too when I looked at Geronimo, but I don’t resonate with it nearly much as the Blue Starfire. How can I obtain one of these Blue Starfire skulls? What does it work with? I have a feeling it works with the Pleiadian Emisaries of Light and the saved Blue Star Lotus energies (Egypt). I’m going to be going to Egypt in December and we will be working with these Blue Star Lotus Energies. It would be great if I had my Blue Starfire skull by then. I’m a quantum healer, highly intuitive, being committed to being of service and to making my ascension in this lifetime. I’m remembering sho I am, the skills I have developed in previous lifetimes and I feel the Blue Starfire skull can help, especially if I am able to have one with me as my friend and companion. Get our FREE book called: Journeys of the Crystal Skull Explorers: The Free E-book 2015 Edition NEW". Click Here! 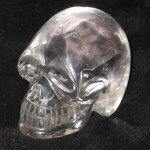 Sign Up for Our FREENewsletter: "The Unfolding of the Crystal Skulls" and get your FREE Gift! Click Here!